In all highly industrialized countries public expenditures are a substantial and growing share of total economic activity. The authors integrate normative and positive theory and empirical analysis of public expenditure, concentrating on the optimal provision of public goods and the estimation of their costs and effects. This volume emphasizes the techniques that are available for reaching collective decisions about the provision of public goods and stresses the importance of income distribution and intergovernmental fiscal relations. In a mixed economy, where the public sector is growing faster than the private sector, the nature of public expenditures must be closely evaluated and studied. 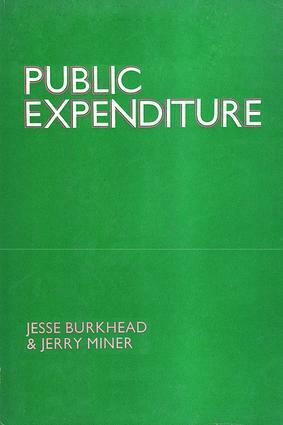 This book is designed to focus on and delineate controversies about public expenditure--to define what it is, analyze its function, show how it operates, and finally to evaluate research on this important subject.The book considers the theories of leading economists (Kenneth Arrow, Lionel Robbins, Carl Shoup, James Buchanan, Paul Samuelson, Richard Musgrave, and others) in arriving at a clear statement of theory in its application to operational problems. Appropriate attention is paid to current techniques such as program budgeting, cost-benefit analysis, and the analysis of the determinants of public expenditure. The book is unique in its emphasis on the integration and critique of contemporary theories of public expenditure, of distributional concerns, and of the political framework of public expenditure decisions. It provides a necessary resource for professional economists required to deal with public expenditure problems in research or practice.